When you have the option to rent a car and temporarily drive something new, why not go with a tried and true American classic – the Ford Mustang? Mustang rentals are a fun, affordable and popular rental car option that’s sure to put a smile on your face as you’re cruising down the road, feeling the wind in your hair with the top down. 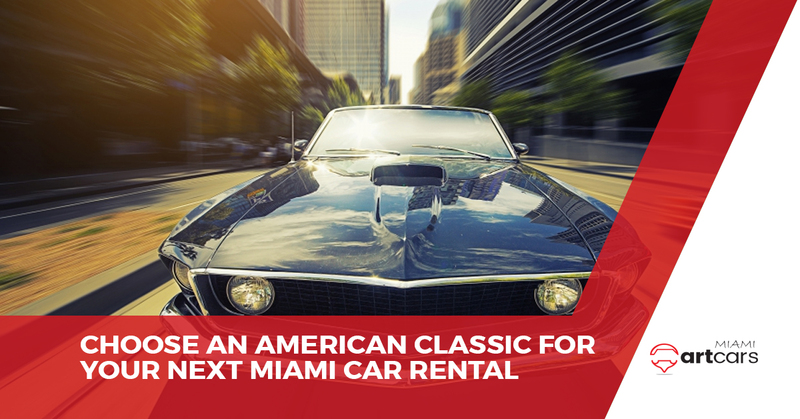 You deserve to drive something fun around Miami while you’re here, so you might as well get something fun, fast, good looking, and something that you’re proud to roll around in. Today, Miami Art Cars is going to look at some of the things that make the iconic Ford Mustang an American classic. From the sleek styling to the ever-respected V8 under the hood, the Ford Mustang has transcended decades of otherwise boring looking cars and always comes out on top as car enthusiast’s favorite classic muscle car. For all of our other luxury car rental, sports car rental, and high-end car rental services here in the Miami area, contact Miami Art Cars today to get the life of your life! The Ford Mustang has been a mainstay in Ford’s lineup of automobiles for over 50 years – most car models that you see on the road these days haven’t been around that long. The fact that Ford yet again recently redesigned the Mustang and continues to put smiles on driver’s faces around the world is a testament to the classic, spirited qualities of the Mustang itself. The Ford Mustang has been in production since the original model in 1964. Before the original model was released in the early 1960s, Ford was looking for a small, sporty car to compete in the marketplace. What Ford came up with was a four-seat automobile that was fun to drive, easy to handle, made a great noise and had lots of horsepower. The only issue was that Ford could not think of a good name for this new and exciting new model of car. After a lot of research, Ford eventually settled on the name “Mustang” because it paid tribute to a World War II fighter plane – you guessed it, the Mustang. Though the new Mustang is offered with a 2.3L EcoBoost engine in order to meet the demands of today’s environmentally-friendly car market, it is of course still offered in a 5.0L V8. Those who get a new Mustang car rental will find that the stylish elements of the interior trim, as well as the torque behind the engine when they put the metal to the floor, are highly reminiscent of the original Mustang. If you’re a Mustang fan and would like to give the new Mustang a spin here in the Miami area, then you’ve come to the right place at Miami Art Cars. Not only do we specialize in exotic car rental and luxury car rental, but we also have an expertise in Mustang rental. While it may be nice to get a supercar rental to blend in here in Miami, a Mustang rental will still have you smiling and looking good as you’re flying down the road. Contact us today about Mustang rentals or other high-end car rentals!